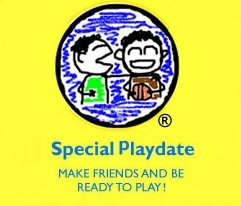 Specialplaydate.com helps parents connect with others to arrange play dates in their local communities. The site enables users to find a playdate for loved ones with or without special needs to create opportunities for them to build social and communication skills while making friends. Check out their site to learn more! Written by: Different Roads to Learning on March 8, 2011. This entry was posted in autism, Community Programs, Resources, Social Skills and tagged ADL's (activities of daily living), autism, autistic spectrum disorder, behavior management, conversational skills, daily routines, generalization of skills, peer play, playdate, social skills, socialization, special needs by Different Roads to Learning. Bookmark the permalink.